I want to venture back into a previous blog with an update. 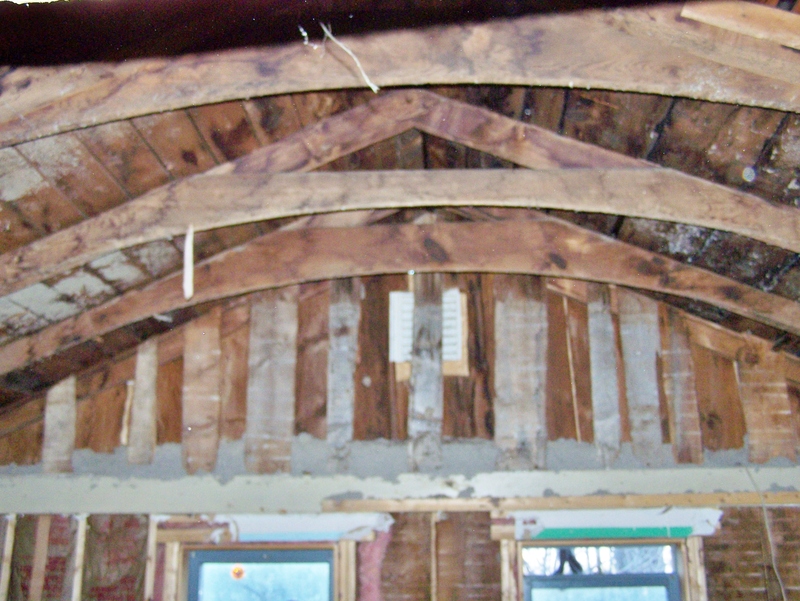 While this unique Gambrel-style frame doesn’t look any different yet on the outside, things are happening beneath the skin. I have lots of pictures – inside and out – to show and will be sharing more in the coming weeks. 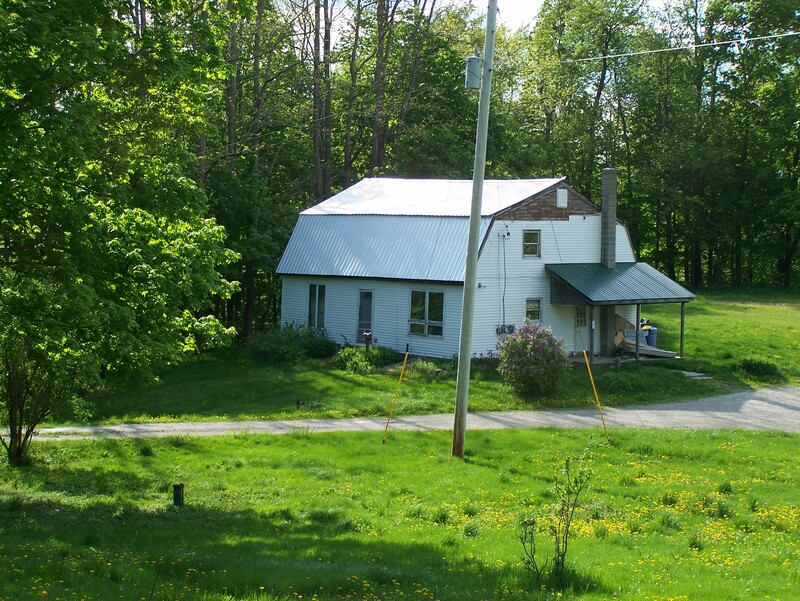 For those of you who missed the last blog, here is a picture of the Gambrel style timber frame house in Danby, VT. The historic property has a unique Gambrel roof. This style of roof originated in Europe, but the term gambrel is an American one. In the US, gambrel roofs are sometimes called Dutch gambrel. Note the double slope on both sides of the roof; this design allows for a more spacious second story. 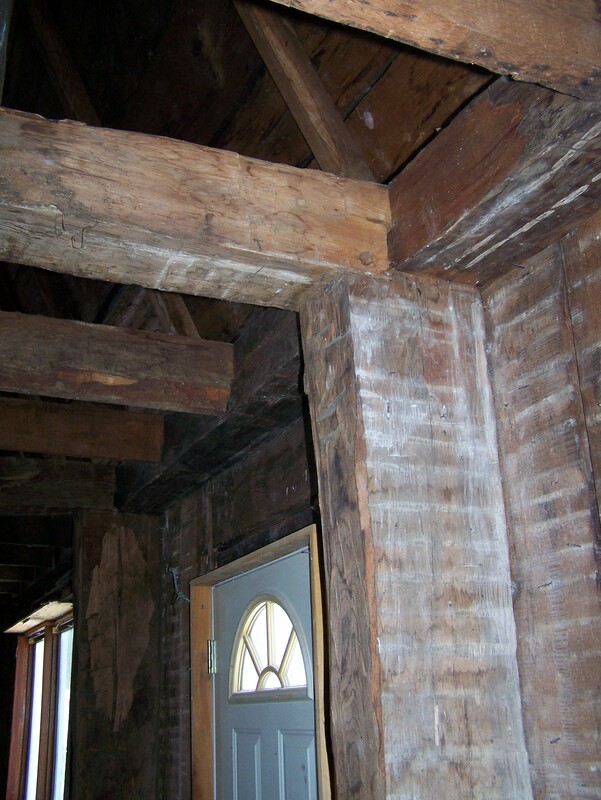 This particular timber frame measures 28×38 feet and features many gunstock posts. 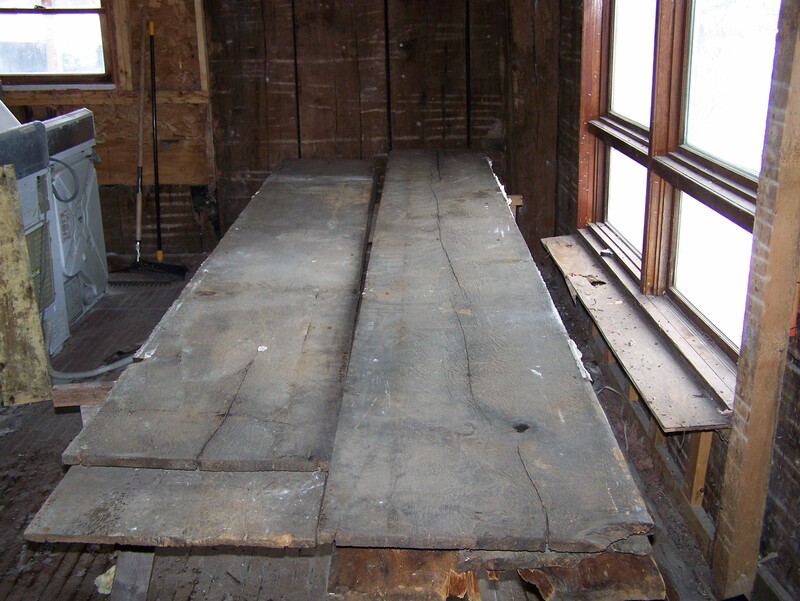 I am working on the restoration together with furniture maker/timber framer Luke Larson. So far, Luke has removed all of the interior walls as well as the second floor wide boards which are made of rare old growth pine. The next phase will be to remove all of the wall and roof boards. Then we can concentrate on carefully dismantling the frame. At that stage, I’ll check back in with pictures of the open timber frame. One unique feature of this frame is the ceiling in the master bedroom. It has beautiful domed rafters. Here you can see one of the gunstock posts very clearly. Note how it carries two different timbers at the top of the post. Gunstock post carrying both top plate and floor girt. 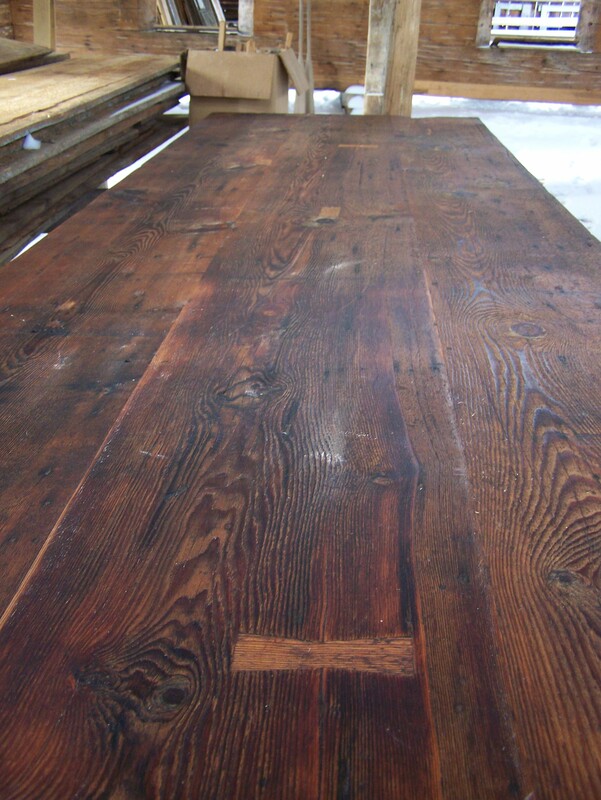 The wide wall planks can make beautiful tables like below. Table made from restored wall planks. 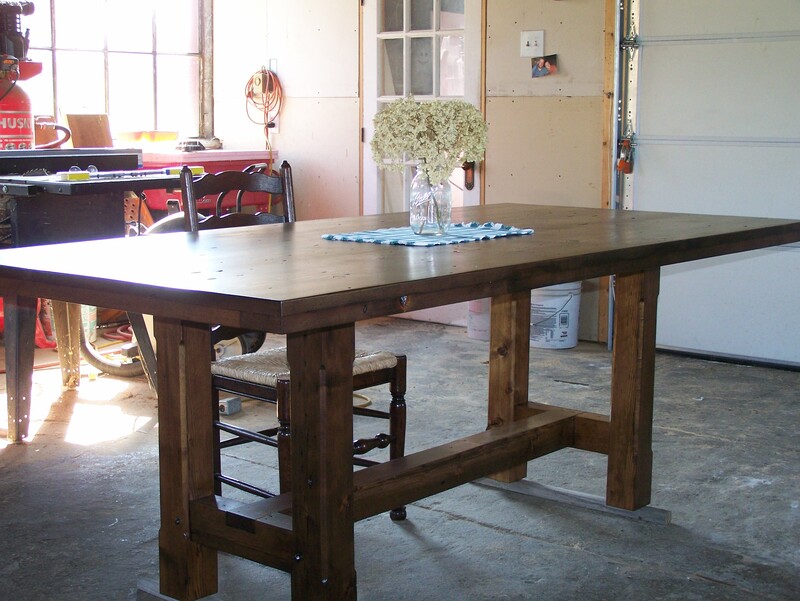 Lots of beautiful work can be done with the wood we salvage from a vintage house. 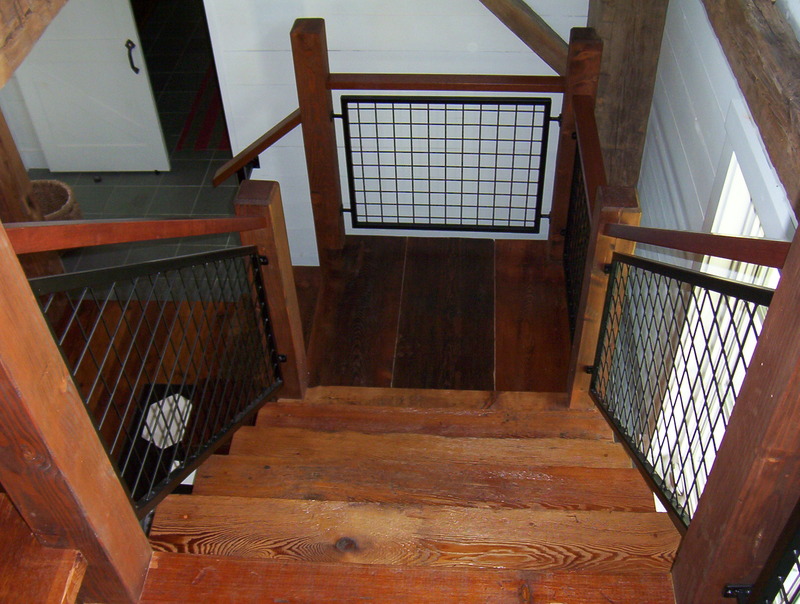 Here is an example of a staircase made from restored wood. How old is this Hand Hewn Timber Frame house? This Gambrel turned up in a 1940 book about historic houses in Rutland County, Vt. According to this book, the frame may be older than we thought – dating from before the 1800s. 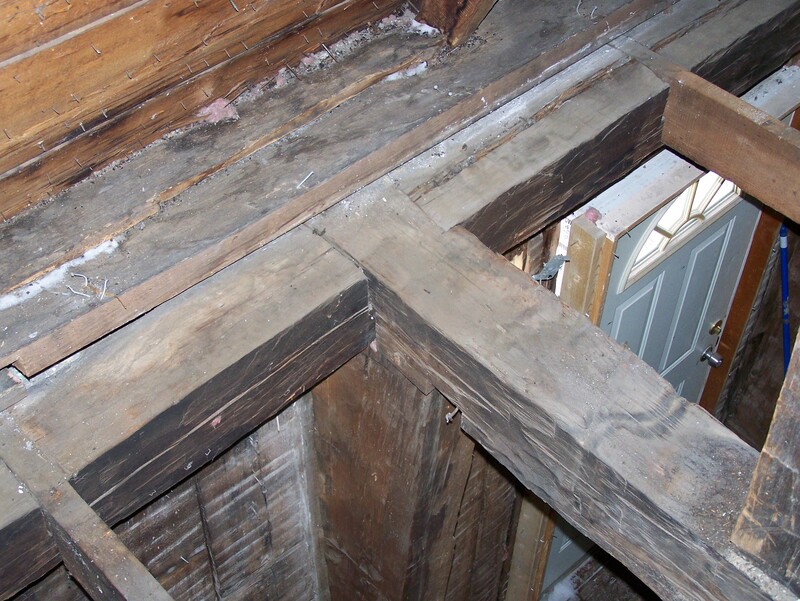 Interested in living beneath these timbers? Who wouldn’t want a master bedroom with a historic domed ceiling from colonial times? Please do be in touch! We have several timber frames for sale, so do contact us with any questions or interest! We always enjoy talking about frames! This entry was posted in Frames in stock, Green Mountain Timber Frames, Post and Beam, Timber Frame Projects and tagged American heritage, available barn frames, barn for sale, colonial america, Green Mountain Timber Frames, gunstock frame, gunstock timber frame, historic post and beam homes, historic properties, old barns, vermont timberframe by Green Mountain Timber Frames. Bookmark the permalink.